Sorry, we are currently sold out of 'Bonavita 1.7L Digital Variable Temperature Gooseneck Kettle'. Please check back later. 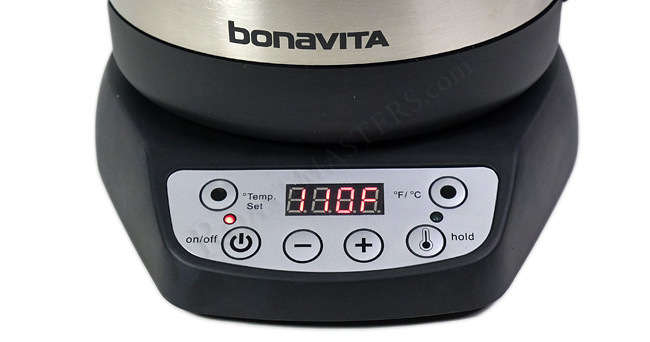 The Bonavita 1.7 Liter Digital Variable Temperature Gooseneck Kettle allows you to adjust temperature in one degree increments from 140� to 212�F. Set the ideal temperature for your beverage whether you're preparing pour-over coffee or steeping your favorite tea. The digital display lets you monitor temperature in real time. Waiting is no fun, so we put a powerful 1500-watt heating element in our kettle. It reaches your desired temperature quickly so you can more quickly make - and enjoy - your drink. The powerful element also means the kettle more accurately maintains the correct temperature.